Okay, you’ve had time to digest the morning posts from CRM Idol, now time for the afternoon reviews That would be Vigilus, Assistly, Front Row Solutions. We’ve tried to be as kind as we can to the good and bad in these reviews. We recognize these are small enthusiastic companies who feel like they are onto something. Some are, some aren’t. Our general approach is that we have to fair and truthful but understand that these smaller entities are not held to the standard we have for the more established, cash richer companies. But they are held to a standard. We want them to succeed, but we think that they have to do some things to do that. Voilà! CRM Idol is a start for those things. Vigilus has a long and tangled history. To boil it down Vigilus provides a version of Act! for Lotus Notes but don’t confuse this with the ACT! owned by Sage. Although both products have their origins in the original Act! product, Vigilus represents a separate evolutionary path begun in 1998 when the original owners of the popular contact manager sold a license to a precursor of Vigilus which formed in 2003. Act! for Notes (AFN) is the premier contact manager for Notes with full integration of email and calendar and Vigilus appears to be in the catbird seat within the Notes market. IBM-Lotus claim a thirty percent marketshare for the category. Vigilus has taken advantage of its unique position and deeply penetrated large markets in manufacturing and financial services among others. Because Lotus Notes is a development platform as well as a personal productivity tool many organizations have, over the years, developed accessory applications that include Notes and contact manager functionality as well as other functions. This multi-layered capability has enabled AFN to persist in many organizations with specific needs including long historical records of customer interactions through email, the ability to schedule multiple resources and centralize all relationship history and the ability to bi-directionally integrate with non-Notes applications. In essence Notes and AFN produced the first cross enterprise collaboration platform at least a decade (or two) ahead of today’s offerings. All this is good and valuable and IBM’s continuing commitment to Notes should assure its long time clients that the solution remains viable and valid well into the future. Our concerns about AFN relate to the user interface and the business process limitations that may be surfaced by reliance on this older architecture. For instance, more elegant ways to develop applications now exist that might favorably compete against Notes which has a database centric model that was serviceable in prior decades but may lack some flexibility in today’s social and cloud computing world. The user interface is a solid rendition of 1990s technology and could use a refresh (Figure 1). For instance, at one point we were told that the system would compile a list of activities, which could then be exported to a spreadsheet. With due respect, we do not believe that spreadsheets should be holding together modern applications. The product is also behind the curve on most social issues. It can access Twitter and LinkedIn but there is as yet no facility for automatically capturing a social feed though there is a third party widget for doing this. While Vigilus acknowledges this deficiency and is committed to rectify it, the solution does not exist right now. Large companies committed to the Notes architecture and approach can probably wait for these improvements. They have a robust contact manager in AFN and their history with Notes and IBM should indicate an interest in preserving what they have and adding functionality as the marketplace ratifies it. New customers will compare AFN and Notes to more modern solutions in their selection processes and at least some will opt for newer interfaces and more socialized solutions. If IBM and Vigilus make a serious attempt to modernize their solution it could be an important force in enterprise computing for a long time. At the core of what any software vendor does are two questions: is there a problem to solve, and is there a market to buy it. Without answers to these questions, there is no point to developing the product. The issues of innovation, what the product does – and how – are secondary to those questions. Can Front Row Solutions adequately answer them? We’re not trying to keep you in suspense, but the answer is at the end of this review. Front Row Solutions developed a product that is strictly aimed at sales managers and (they claim) sales people. Their premise is that sales people must spend up to two hours every day entering information into sales force automation tools just to satisfy the needs of sales management. While we may not agree on the two hour timeframe, this has been an item of contention for SFA from the very beginning and one of the reasons it had poor adoption rates: the only purpose of entering this data is to provide management with visibility (supposedly) into the pipeline. There is limited value to the salesperson in entering this information (tracking their deals, possibly), and most definitely no value to the customer. While this is a task that takes time and effort on the salesperson’s part, most of the SFA and CRM tools have, by now, greatly improved their approaches to it, including the launch of Salesforce, whose claim to fame was simplicity and a mobile-based interface to enter this data in a simple manner. 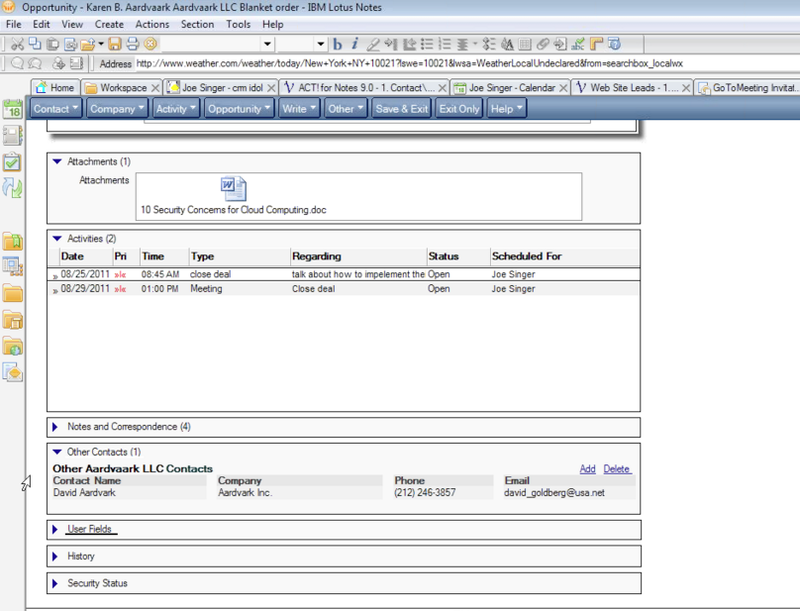 Virtually all CRM solutions today offer a very easy, fast interface to enter sales information, from virtually anywhere. Front Row Solutions aimed at optimizing and improving that model. a variety of interfaces to enter the information, and a very robust reporting platform. 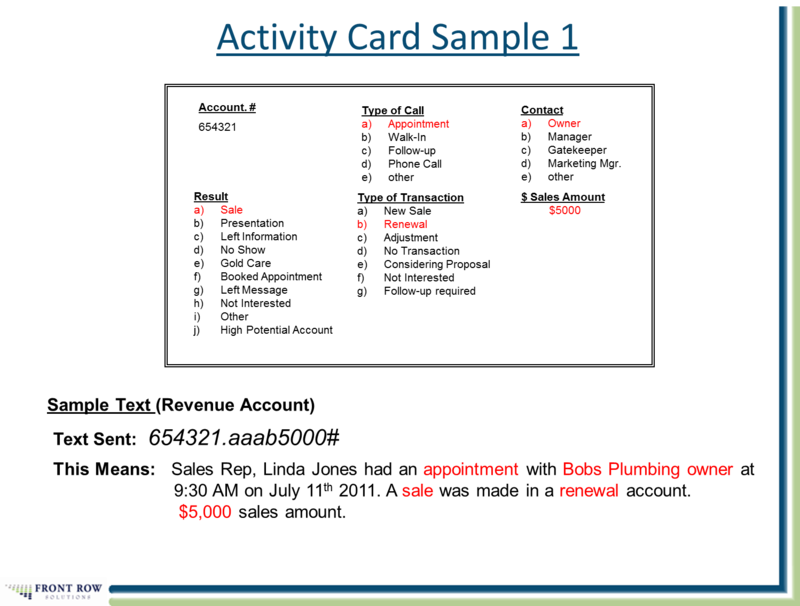 The activity card is a summary of all tasks, stages, transactions, account information, and more that a sales rep needs to enter. In the example the salesperson had an appointment with the owner of an existing account for a renewal in the amount of $5,000.00, and instead of navigating through screens to enter that, they type the string “654321.aaab5000#” into either an email or text, or entered through a variety of interfaces (second component). This string would be sent to the server, which would then enter the information into the system (Note: there is no integration with CRM, except for one Microsoft Dynamics instance means the data lives in a silo). The information would then update the sales manager’s dashboard in real time as well as be available for reporting (third component). One problem that we see in this approach is that it requires the use of a cheat sheet, which means that without it, a salesperson couldn’t use the product. This is by no means intuitive. There is some value to this solution, clearly, to the sales manager but we are going back to the original problems of adoption that CRM had: if there is no obvious value to the customer or the employee – is it worth implementing? Through a spirited discussion with Front Row Solutions, the answer came back in the form of non-US markets (although that is not Front Row Solutions main market today, we believe they may spend more time looking at it going forward) and a few instances in the US Market. There are many foreign markets where the cell phone, or smartphone, is the only “computer” a salesperson has. Even then, there is unlikely to be any CRM solution running in the background, considering costs of acquisition, deployment, and maintenance. In those instances, the sales manager would have very poor, if any, visibility into their pipeline and more than likely they would have to wait for the salesperson to find the time to either return to the office to use the computer there, or fill out the paperwork. While the value to the customer, and even the salesperson, of these actions has not yet been proven (and likely never will be), the actions are taken for the benefit of management. This brings us back to the original question: Is there a problem to solve? Potentially, in some markets, yes. Is there a market for it? Yes, but not the one where they are mostly playing. In addition to an inconclusive value proposition for the CRM market as a whole, the two biggest issues that Front Row Solutions has are the price they charge (fifty dollars per user per month, which is in addition to any CRM tool the organization may have deployed), and getting over the fact that their product is not a customer-centric, customer-driven, social-customer focused product and merely provides a potential value to the sales manager. While the idea of summarizing complex transactions into a simple string is certainly innovative, and reminds us of the old days of data processing, we don’t believe the product has the value they claim for the CRM market – certainly not for that price. We encourage them to investigate foreign markets as a potential expansion opportunity, to find a way to build an add-on product for established CRM products (or even connectors for them) as ways to leverage the investment they have already made in the client has already made. We also recommend they look for further opportunities to use their coded-message model (their slides mentioned service, but this was not part of the demo) as a way to create more opportunities to show value to the organization. We would like to say they should find a way to prove value back to the customer of their clients, but since this is an operations-focused product we are not certain that is possible. However, they definitely need to reconsider their price point. If you have a large Salesforce, need more visibility into their activities, your CRM system cannot accommodate quick entry and reporting, and you have a heavy focus on operational excellence as opposed to product leadership or customer intimacy – this may be a product to look at. However, we are not certain how large that market is today.